This section is home to our delightful collection of backpacks and rucksacks. 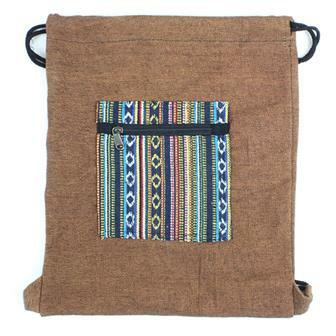 Using a variety of both bright and traditional fabrics from around the world, these useful bags are perfect for everyday use at school or work, on holiday or the festival field. 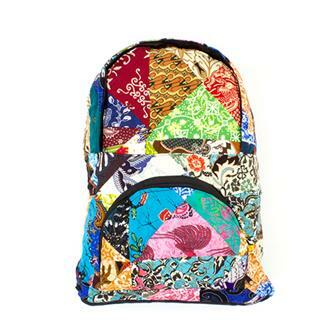 Brilliantly bright, bountifully big backpack bursting with bonkers beauty. 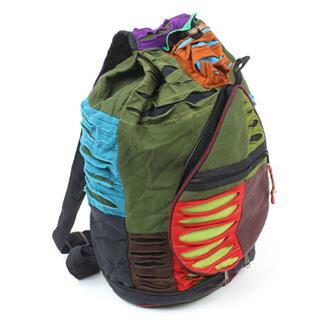 This rucksack with its zipped compartments and adjustable straps is great as an everyday bag. 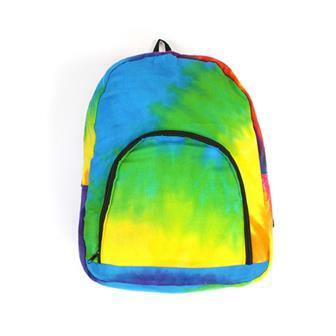 Made in our popular spirally fabric, these great backpacks have loads of pockets, twin straps and are cotton lined. 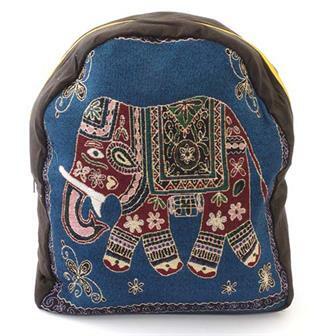 Handmade in Thailand, these colourful back packs each feature an embroidered elephant decoration. This limited edition backpack comes in mixed styles and colours. These radiant rucksacks are handmade in Bali using various patches of fabric off-cuts stitched together to form an astounding array of abstract amazement! 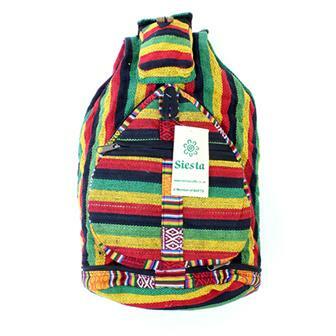 Each rucksack is lined, has zipped pockets and adjustable straps. Mixed Fabrics - Patches vary. 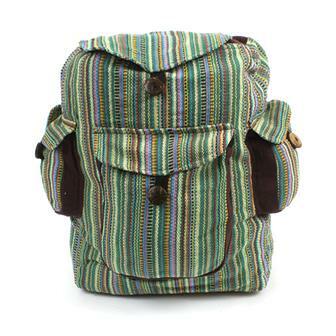 Hand produced in Northern Thailand using our colourful Thai weave material, these handy rucksacks have two pockets. 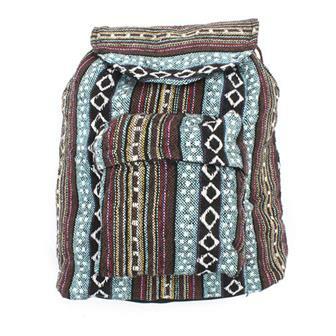 These spacious and comfortable backpacks are handmade in Kathmandu, Nepal. Featuring a three side pockets and a large main compartment they are perfect for taking to school, the gym or the office. Available in a mixture of bright and hard wearing gheri materials. These large backpacks have a plethora of zipped compartments and feature a pleasing U curve shape and adjustable shoulder straps. Each one is made from bold and colourful heavy gheri cotton material from Nepal. This useful, strong and spacious backpack leads a double life and can actually collapse down into a much smaller, space saving size. 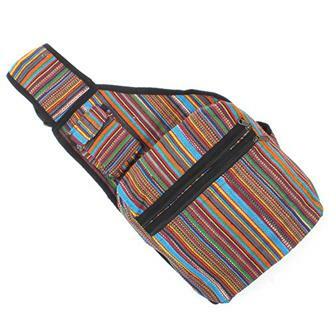 Perfect for keeping packed down in a suitcase or rucksack to be unzipped and used as a day bag. This cool backpack can be folded down inside itself, turning it into a much smaller pack.This feature, combined with its useful zip pockets and spacious main compartment, make it perfect as a day bag on trips away. Made in a style inspired by bicycle courier sling bags, these over-the-shoulder satchels are perfect for comfortable use on foot or on bike. The bag's pockets have been designed to allow easy access for the front two and added security for the inside one. The satchel also has an extra velcro pocket for a mobile phone. 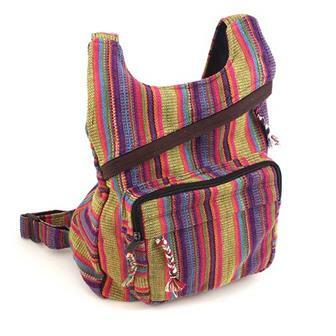 Colourful and practical, these patch rucksacks are each handmade from tough Nepalese gheri material. 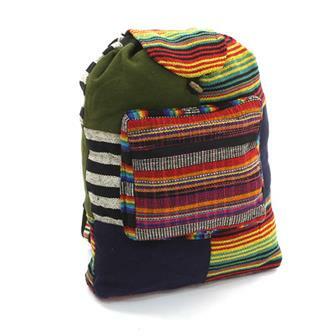 Each one has a drawstring top, a front zip pocket and make excellent school or work bags.